Remember when games had blue skies? When environments were boundless playgrounds of imagination? When character models had just that, character? We do. But in a world of gloomy skyscapes, barren wastelands and gruff space marines, you could forgive us for wondering if we were alone. But hang on a sec, who’s this flying over the horizon with a wink and a cheesy grin? It’s Joe Danger, ready to bring a bit of old-school joy back to gaming! Here’s the premise: You are the eponymous daredevil, a kind of shop-worn Evel Knievel. Humiliated by the evil Team Nasty at the start of the game, you must guide Joe back to fame, fortune and his rightful place as the Master of Disaster. As set-ups go, it’s as gloriously silly as they come. Everything about Joe Danger is inviting. The colorful environments, the cheesy Hammond-organ theme that parps along in the background, the big fat gold coins, even Joe himself has an air of approachable affability. Nobody ever fancied a pint with Marcus Fenix now did they? The sense of enthusiasm that radiates from Joe Danger is a direct reflection of it’s creators Hello Games. The tiny UK development studio have poured every ounce of their infectious verve into bringing the game to life. It is a joy to watch in action. And that’s before you even pick up the controller. Perhaps it’s a convenient observation, but it’s apparent that some of the team have worked on iterations of Geometry Wars. In that game score building was the obvious incentive, but swooping, looping and diving around was a joy in itself. Pacificism (from Geometry Wars Advance 2) is the best mode in the entire series precisely because it accentuates these very qualities. Joe Danger is no different. In the early levels we were shown it felt so good just getting the little fella zooming along, that a reluctance to disrupt the flow spurred us on as much as any in-game penalty. To achieve this, you’ll have to boost, duck bars, avoid giant springs, boxing gloves and jump shark-infested pools, all in the name of getting Joe across the finish line without harm. It’s here that the platform element of Joe Danger becomes apparent. You’ll have to switch lane to avoid obstacles, time that duck and hop combination just right, double jump to reach a trickily positioned platform – all while maintaining perpetual motion. Think of it like an old school platform level where the screen is constantly moving, except you are the one moving it. Or perhaps more significantly, think Sonic. Alongside all of this there’s a touch of Tony Hawk in there too, most obviously in the charge and release jumping, bonus points for mid-air flips and collectible D-A-N-G-E-R letters. All this talk of other games may suggest a derivative experience, but that would be unfair. 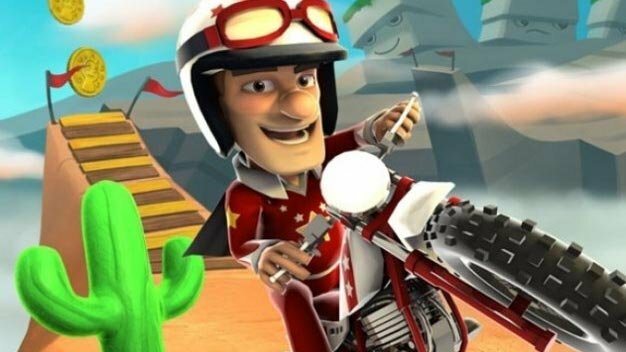 Joe Danger is best described as a game that draws on the most enjoyable elements of a raft of classics to create something that is at once familiar and welcoming, but also entirely fresh-feeling. It’s just fun. Knowing that the basic elements of the game have been nailed in such a satisfying way only makes us more excited about the promised additions. There’s a tonne of gameplay modes and extras on the way to the finished game, including; a level-editor puzzle mode that allows you to drop elements into the environment on the fly, coin dash, a 6-player Road Rash-style race mode, a post-crash aftertouch feature and challenge modes. By the time Joe crosses the development chequered flag, he should have amassed an impressive amount of content. Ok, so we’ve bundled over the line of dispassionate, even-handed previewing here. Perhaps we should say that Joe Danger may just stink up your console like a day old dog poo. But we’re not going to. We await the arrival of the finished game with childish glee. Read our interview with Hello Games’ MD Sean Murray here. 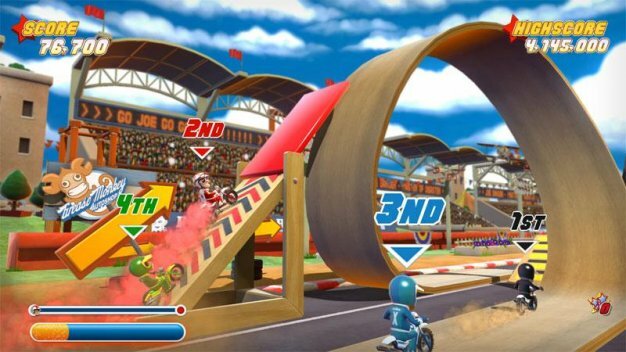 Joe Danger is set for a spring release on XBLA or PSN. They haven’t decided yet. Fingers crossed it’s both.